We propose a novel approach to enhance the discriminability of Convolutional Neural Networks (CNN). The key idea is to build a tree structure that could progressively learn fine-grained features to distinguish a subset of classes, by learning features only among these classes. Such features are expected to be more discriminative, compared to features learned for all the classes. 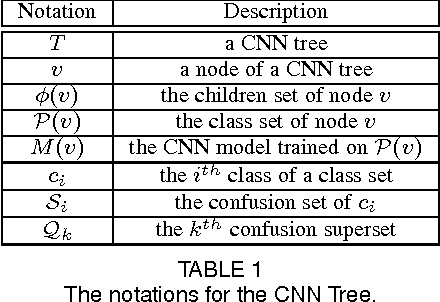 We develop a new algorithm to effectively learn the tree structure from a large number of classes. Experiments on large-scale image classification tasks demonstrate that our method could boost the performance of a given basic CNN model. Our method is quite general, hence it can potentially be used in combination with many other deep learning models. This paper proposes a novel Affine Subspace Representation (ASR) descriptor to deal with affine distortions induced by viewpoint changes. Unlike the traditional local descriptors such as SIFT, ASR inherently encodes local information of multi-view patches, making it robust to affine distortions while maintaining a high discriminative ability. To this end, PCA is used to represent affine-warped patches as PCA-patch vectors for its compactness and efficiency. 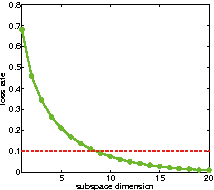 Then according to the subspace assumption, which implies that the PCA-patch vectors of various affine-warped patches of the same keypoint can be represented by a low-dimensional linear subspace, the ASR descriptor is obtained by using a simple subspace-to-point mapping. Such a linear subspace representation could accurately capture the underlying information of a keypoint (local structure) under multiple views without sacrificing its distinctiveness. To accelerate the computation of ASR descriptor, a fast approximate algorithm is proposed by moving the most computational part (ie, warp patch under various affine transformations) to an offline training stage. Experimental results show that ASR is not only better than the state-of-the-art descriptors under various image transformations, but also performs well without a dedicated affine invariant detector when dealing with viewpoint changes. 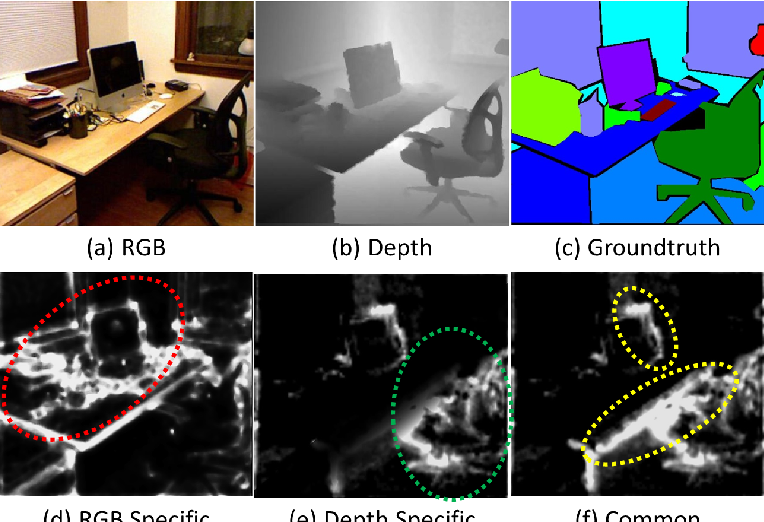 In this paper, we tackle the problem of RGB-D semantic segmentation of indoor images. 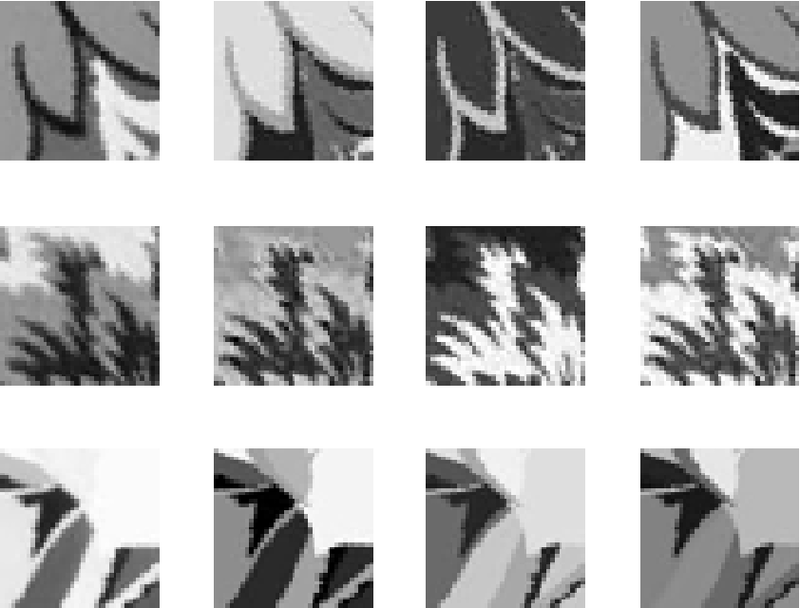 We take advantage of deconvolutional networks which can predict pixel-wise class labels, and develop a new structure for deconvolution of multiple modalities. 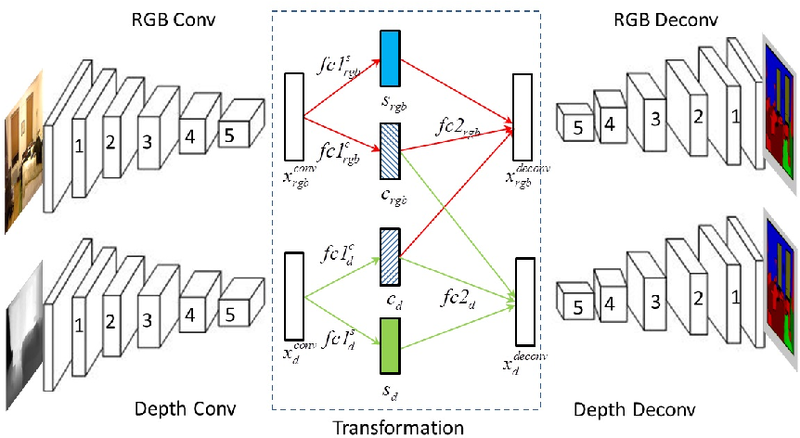 We propose a novel feature transformation network to bridge the convolutional networks and deconvolutional networks. In the feature transformation network, we correlate the two modalities by discovering common features between them, as well as characterize each modality by discovering modality specific features. With the common features, we not only closely correlate the two modalities, but also allow them to borrow features from each other to enhance the representation of shared information. With specific features, we capture the visual patterns that are only visible in one modality. 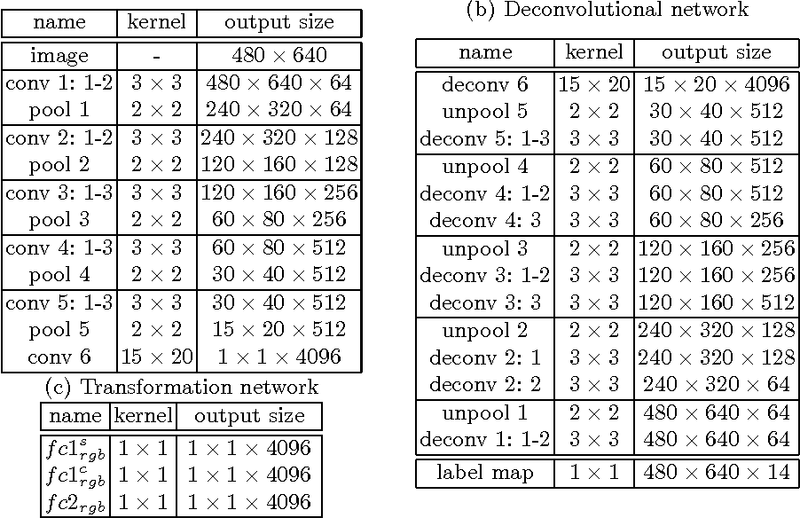 The proposed network achieves competitive segmentation accuracy on NYU depth dataset V1 and V2. According to observations, different visual objects have different salient features in different scenarios. Even for the same object, its salient shape and appearance features may change greatly from time to time in a long-term tracking task. Motivated by them, we proposed an end-to-end feature fusion framework based on Siamese network, named FF-Siam, which can effectively fuse different features for adaptive visual tracking. The framework consists of four layers. A feature extraction layer is designed to extract the different features of the target region and search region. The extracted features are then put into a weight generation layer to obtain the channel weights, which indicate the importance of different feature channels. Both features and the channel weights are utilized in a template generation layer to generate a discriminative template. Finally, the corresponding response maps created by the convolution of the search region features and the template are applied with a fusion layer to obtain the final response map for locating the target. Experimental results demonstrate that the proposed framework achieves state-of-the-art performance on the popular Temple-Color, OTB50 and UAV123 benchmarks. Local feature descriptors have been widely used in fine-grained visual object search thanks to their robustness in scale and rotation variation and cluttered background. However, the performance of such descriptors drops under severe illumination changes. In this paper, we proposed a Discriminative and Contrast Invertible (DCI) local feature descriptor. 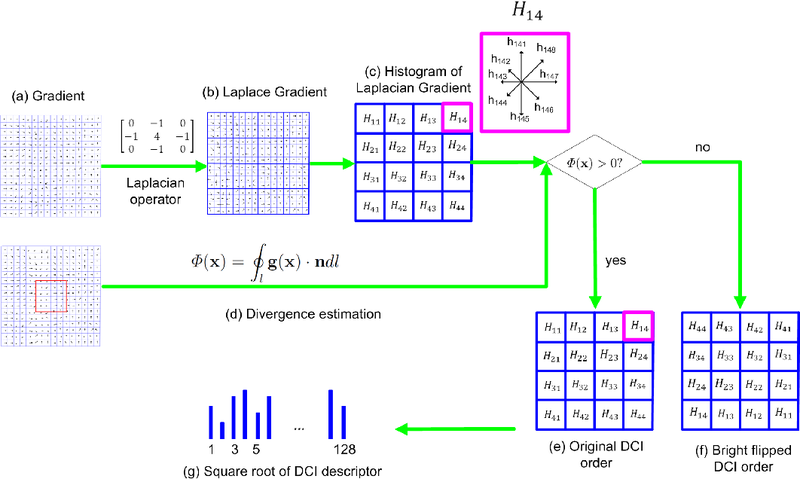 In order to increase the discriminative ability of the descriptor under illumination changes, a Laplace gradient based histogram is proposed. 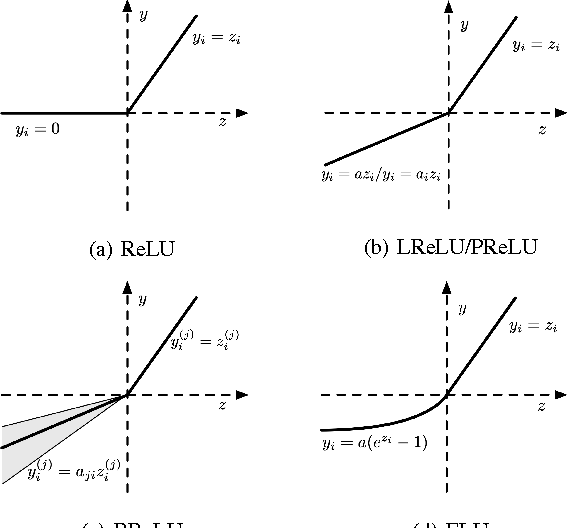 A robust contrast flipping estimate is proposed based on the divergence of a local region. 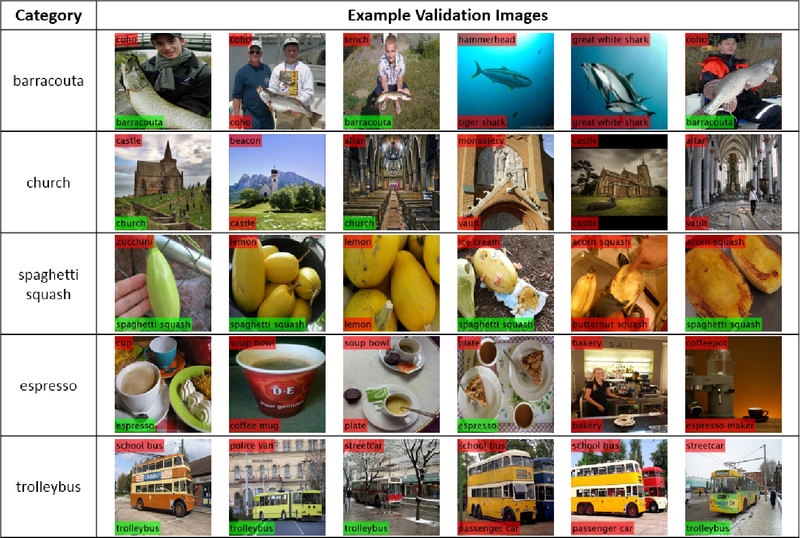 Experiments on fine-grained object recognition and retrieval applications demonstrate the superior performance of DCI descriptor to others. The process of aligning a pair of shapes is a fundamental operation in computer graphics. Traditional approaches rely heavily on matching corresponding points or features to guide the alignment, a paradigm that falters when significant shape portions are missing. 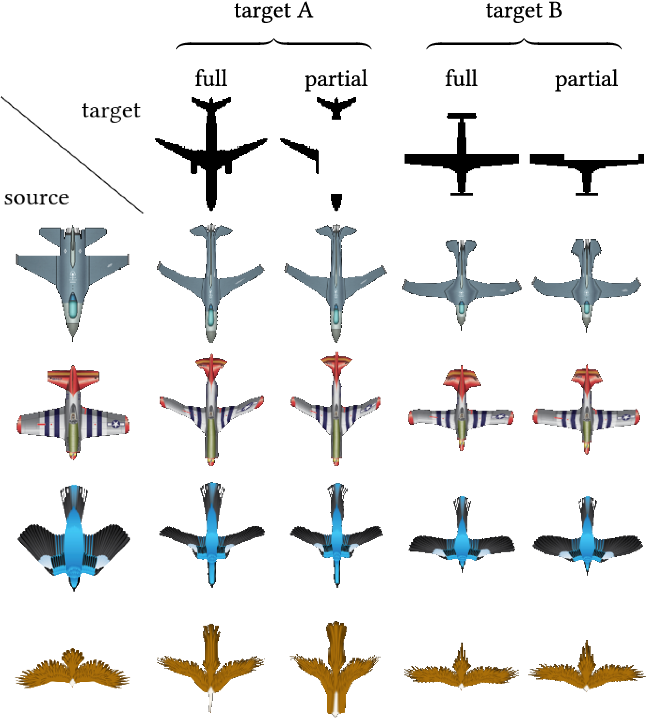 These techniques generally do not incorporate prior knowledge about expected shape characteristics, which can help compensate for any misleading cues left by inaccuracies exhibited in the input shapes. We present an approach based on a deep neural network, leveraging shape datasets to learn a shape-aware prior for source-to-target alignment that is robust to shape incompleteness. In the absence of ground truth alignments for supervision, we train a network on the task of shape alignment using incomplete shapes generated from full shapes for self-supervision. Our network, called ALIGNet, is trained to warp complete source shapes to incomplete targets, as if the target shapes were complete, thus essentially rendering the alignment partial-shape agnostic. We aim for the network to develop specialized expertise over the common characteristics of the shapes in each dataset, thereby achieving a higher-level understanding of the expected shape space to which a local approach would be oblivious. We constrain ALIGNet through an anisotropic total variation identity regularization to promote piecewise smooth deformation fields, facilitating both partial-shape agnosticism and post-deformation applications. We demonstrate that ALIGNet learns to align geometrically distinct shapes, and is able to infer plausible mappings even when the target shape is significantly incomplete. We show that our network learns the common expected characteristics of shape collections, without over-fitting or memorization, enabling it to produce plausible deformations on unseen data during test time. 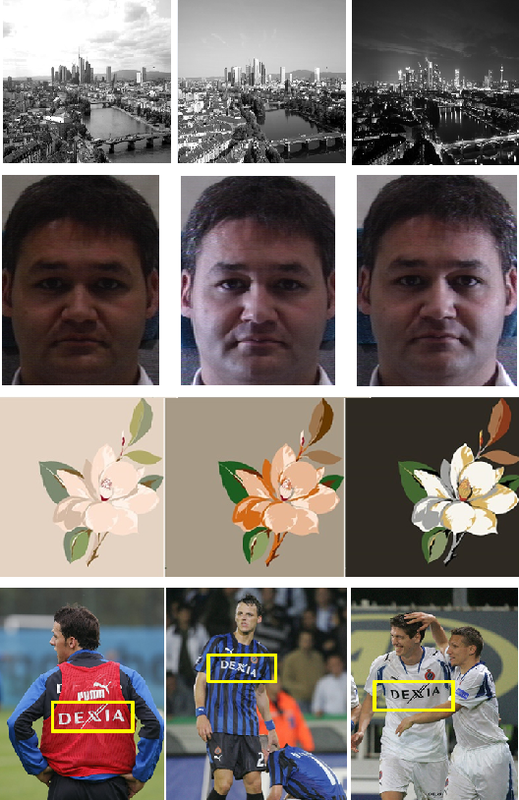 Contextual information provides important cues for disambiguating visually similar pixels in scene segmentation. In this paper, we introduce a neuron-level Selective Context Aggregation (SCA) module for scene segmentation, comprised of a contextual dependency predictor and a context aggregation operator. 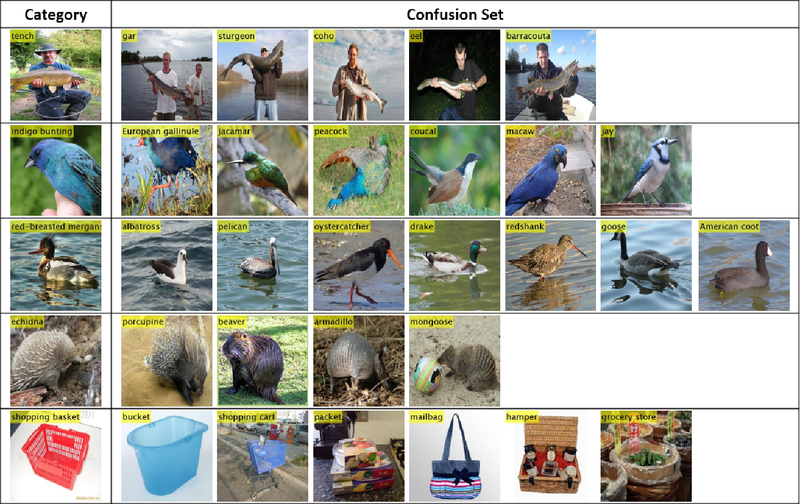 The dependency predictor is implicitly trained to infer contextual dependencies between different image regions. The context aggregation operator augments local representations with global context, which is aggregated selectively at each neuron according to its on-the-fly predicted dependencies. 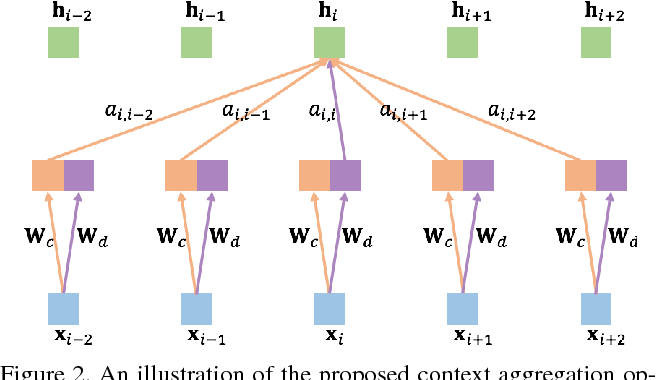 The proposed mechanism enables data-driven inference of contextual dependencies, and facilitates context-aware feature learning. The proposed method improves strong baselines built upon VGG16 on challenging scene segmentation datasets, which demonstrates its effectiveness in modeling context information. 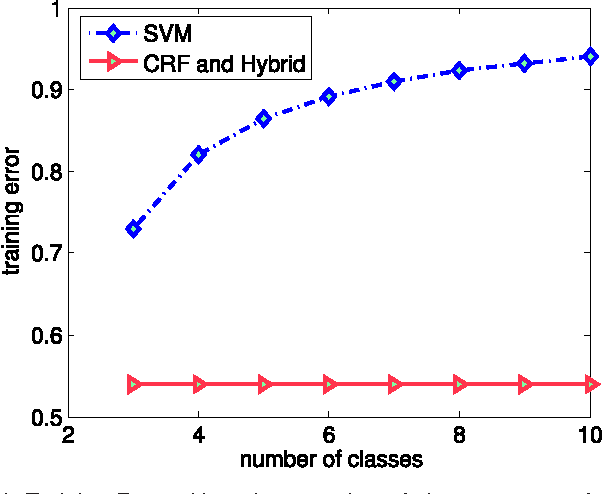 We propose a novel hybrid loss for multiclass and structured prediction problems that is a convex combination of a log loss for Conditional Random Fields (CRFs) and a multiclass hinge loss for Support Vector Machines (SVMs). We provide a sufficient condition for when the hybrid loss is Fisher consistent for classification. This condition depends on a measure of dominance between labels--specifically, the gap between the probabilities of the best label and the second best label. We also prove Fisher consistency is necessary for parametric consistency when learning models such as CRFs. We demonstrate empirically that the hybrid loss typically performs least as well as--and often better than--both of its constituent losses on a variety of tasks, such as human action recognition. In doing so we also provide an empirical comparison of the efficacy of probabilistic and margin based approaches to multiclass and structured prediction. The availability of the large-scale labeled 3D poses in the Human3.6M dataset plays an important role in advancing the algorithms for 3D human pose estimation from a still image. We observe that recent innovation in this area mainly focuses on new techniques that explicitly address the generalization issue when using this dataset, because this database is constructed in a highly controlled environment with limited human subjects and background variations. Despite such efforts, we can show that the results of the current methods are still error-prone especially when tested against the images taken in-the-wild. In this paper, we aim to tackle this problem from a different perspective. We propose a principled approach to generate high quality 3D pose ground truth given any in-the-wild image with a person inside. We achieve this by first devising a novel stereo inspired neural network to directly map any 2D pose to high quality 3D counterpart. We then perform a carefully designed geometric searching scheme to further refine the joints. Based on this scheme, we build a large-scale dataset with 400,000 in-the-wild images and their corresponding 3D pose ground truth. This enables the training of a high quality neural network model, without specialized training scheme and auxiliary loss function, which performs favorably against the state-of-the-art 3D pose estimation methods. We also evaluate the generalization ability of our model both quantitatively and qualitatively. Results show that our approach convincingly outperforms the previous methods. We make our dataset and code publicly available. Human 3D pose estimation from a single image is a challenging task with numerous applications. Convolutional Neural Networks (CNNs) have recently achieved superior performance on the task of 2D pose estimation from a single image, by training on images with 2D annotations collected by crowd sourcing. This suggests that similar success could be achieved for direct estimation of 3D poses. However, 3D poses are much harder to annotate, and the lack of suitable annotated training images hinders attempts towards end-to-end solutions. To address this issue, we opt to automatically synthesize training images with ground truth pose annotations. Our work is a systematic study along this road. We find that pose space coverage and texture diversity are the key ingredients for the effectiveness of synthetic training data. We present a fully automatic, scalable approach that samples the human pose space for guiding the synthesis procedure and extracts clothing textures from real images. Furthermore, we explore domain adaptation for bridging the gap between our synthetic training images and real testing photos. We demonstrate that CNNs trained with our synthetic images out-perform those trained with real photos on 3D pose estimation tasks. Background and objective: Combined evaluation of lumbosacral structures (e.g. nerves, bone) on multimodal radiographic images is routinely conducted prior to spinal surgery and interventional procedures. Generally, magnetic resonance imaging is conducted to differentiate nerves, while computed tomography (CT) is used to observe bony structures. The aim of this study is to investigate the feasibility of automatically segmenting lumbosacral structures (e.g. nerves & bone) on non-contrast CT with deep learning. Methods: a total of 50 cases with spinal CT were manually labeled for lumbosacral nerves and bone with Slicer 4.8. The ratio of training: validation: testing is 32:8:10. A 3D-Unet is adopted to build the model SPINECT for automatically segmenting lumbosacral structures. 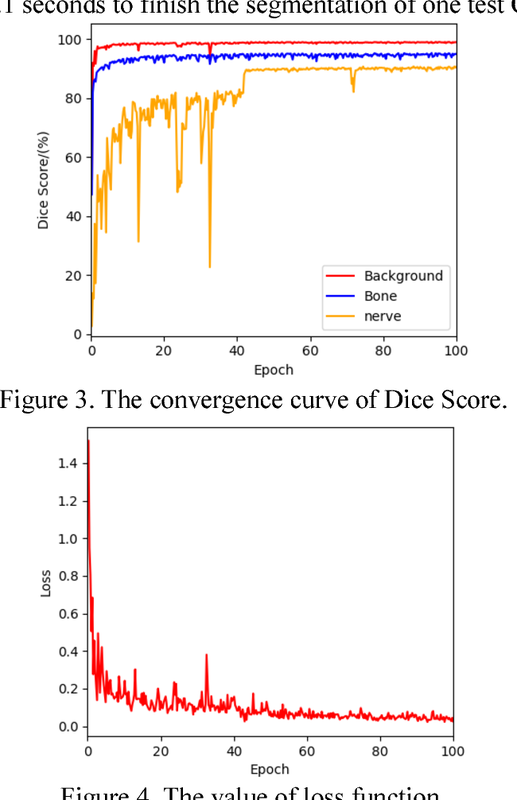 Pixel accuracy, IoU, and Dice score are used to assess the segmentation performance of lumbosacral structures. Results: the testing results reveals successful segmentation of lumbosacral bone and nerve on CT. The average pixel accuracy is 0.940 for bone and 0.918 for nerve. The average IoU is 0.897 for bone and 0.827 for nerve. The dice score is 0.945 for bone and 0.905 for nerve. Conclusions: this pilot study indicated that automatic segmenting lumbosacral structures (nerves and bone) on non-contrast CT is feasible and may have utility for planning and navigating spinal interventions and surgery.